TC & N Taylor: New crop for the 2018/19 season. Many people swear by chamomile tea to calm their nerves. This cheery herb can be extremely useful as part of an organic integrated biodiversity plan. 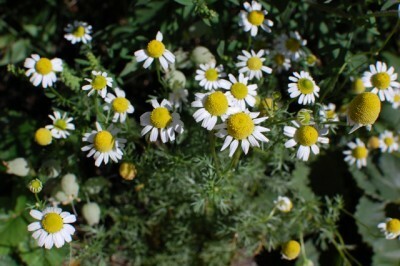 Chamomile tea is a popular herbal drink made from the flowers of this fully hardy perennial. The feathery green leaves are highly fragrant when touched or crushed, and in small amounts can be finely chopped to flavor cream sauces. By companion planting with chamomile, its natural anti-bacterial and anti-fungal properties can help plants prone to fungus, mildew, mold, blight and other common plant ailments. Annuals susceptible to fungal problems, such as zinnias, petunias, snapdragons and verbena, as well as blight prone vegetables, like tomatoes and potatoes, can all benefit by having chamomile as their neighbour. This year we will be growing a small area to assess how well it grows on our farm; more news to follow as the season progresses.